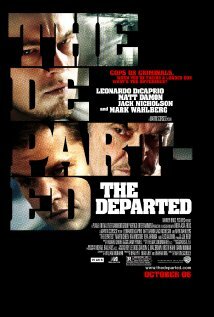 The Departed (2006): Dir. Martin Scorsese. Written by William Monahan. Based upon the film Mou gaan dou written by Alan Mak and Felix Chong. Starring: Leonardo DiCaprio, Matt Damon, Jack Nicholson, Martin Sheen, and Mark Wahlberg. Rated R for strong brutal violence, pervasive language, some strong sexual content and drug material. Running time: 151 minutes. Amazingly, one of America’s greatest filmmakers had never won an Academy Award prior to 2006. Many speculate the Academy was attempting to make up for past misdeeds. Yet the film holds up in its own right, boasting a rogue’s gallery of Hollywood heavyweights, and starring the director’s much-imitated, never-replicated style. Set in Boston, the film parallels the lives of two men: a State Trooper who infiltrates the Irish Mob, and a mobster who infiltrates the State Police. As the two men seek to uncover secrets, they soon become aware of each other’s presence, and a cat-and-mouse game ensues. Despite a new setting, Scorsese directs with a fury that impresses on a superficial level, while accentuating character details and condensing exposition. Scorsese’s longtime editor Thelma Schoonmaker always keeps thing interesting by cutting when we least expect it, and in turn, heightening the drama. Scorsese has long avoided conventional plots in his film, but here we see how he masterfully ratchets up and then maintains suspense–even a cell phone conversation bristles with stakes of life and death. While not as tangible as New York necessarily, the new setting feels authentic thanks to a dynamite cast. Some folks play to the cheap seats (namely Jack Nicholson as mob boss Frank Costello), but Leonardo DiCaprio and Matt Damon play wonderfully convincing foils. Despite all the technical jargon (microprocessors, special investigation units), Scorsese and screenwriter William Monahan remain focused on questions of identity, as the characters discover that good and evil exist on both sides of the law. Dialogue takes on darker meaning as we begin to question where the charades end and honest intentions begin. The film perhaps stretches itself thin (perhaps due to being a remake) but it’s always entertaining, even as it lacks the emotional heft of past Scorsese efforts. But it’s a wonderful reminder that the Academy doesn’t have to settle for lackluster prestige pictures.